Of the various different evangelism styles, I tend to lean towards a conversational style that can be effective in both contact evangelism as well as incarnational evangelism. 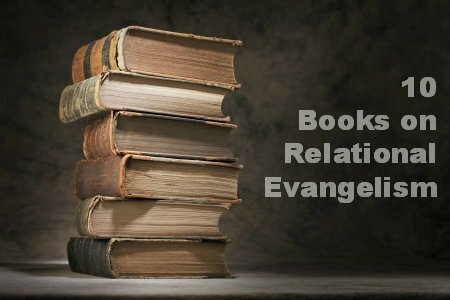 If you want to read some books that focus on relational evangelism, here my favorite list of 10 books on Relational Evangelism. I heard someone say at a home school seminar something like this! Any curriculum works if the teacher works! Maybe this applies to your subject also! We can read books, go to lectures, watch DVDs or Internet but sometime we must get out there and get started! God wants us to work and He does not grade us on instant results! Some of us maybe one or two talent people whiles maybe multied talent! to scatter the seed and trust God! My dad used to say if just one person reads my gospel tract or gospel calendar and gets saved! It will be worth it! We will not always see results but our job is to sow the good seed! We often quit to soon! God hires His workman to sow the seed! Incidently my dad gave a Good Seed daily gospel calendar and the neighbor came to The Lord Jesus Christ as Saviour! Thank you for the list of helpful books!